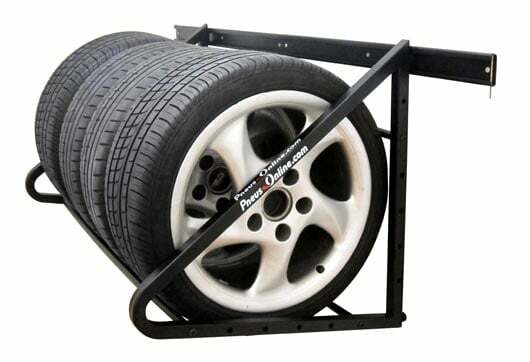 This tyres's shelf is ideal for the storage of your summer tyres during the winter period (and vice versa) and allows you to optimize the space in your parking lot. Adjustable and resistant, it allows you to store for example up to 8 tyres or complete wheels of 205 broadwide. Made of very resistant mettalic tubes, it can be hung on all kinds of rigid walls (except for wood or plaster walls). The shelf can bear a maximum weight of 396.83 pounds and is suitable for tyres or complete wheels with a rim diameter up to 21 inches included. Provided in a kit with its instructions's notice (also downloadable here). This tyres's shelf has a one year warranty. The tyres's shelf is designed to allow you to store your tyres or complete wheels for a long time, in a standing position, without the need of turning them every 4 weeks. The technology develloped by PNEUS ONLINE for this shelf will avoid you to have flat zones on your tyres. - Allows to correctly store your tyres or complete wheels in the "off-season"